The Heart of Wessex Local Action Group (LAG) held a busy and very well attended launch event at the Cheese & Grain on Wednesday 17th June. 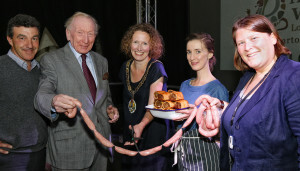 Over 150 guests were entertained by Geniology, a 4 piece jazz band before the Mayor of Frome formally launched the funding programme by ceremoniously cutting a string of locally sourced sausages. Having recently secured £1.74 million through the Rural Development Programme to invest in projects that directly support the rural economy, the LAG will be able to support innovative projects aimed at increasing farm productivity, developing micro and small enterprises and farm diversification, rural tourism, rural services, cultural and heritage activity and increasing forestry productivity. The enthusiastic audience heard about how to get involved in deciding how the money is invested and how to apply for funding. Sarah Dyke-Bracher, from the Heart of Wessex LAG said, “Securing this funding is an amazing achievement and seeing such a great turn out for our official launch reflects the hard work and commitment of local people, partner organisations and the programme management team. “We want to deliver optimum value for money by identifying projects that will provide innovative and collaborative solutions to support the rural economy that create new jobs and growth throughout our LAG area. The Local Action Group is a community led organisation that works best when as many people as possible get involved because every single person brings their own experience, understanding and local knowledge to the group, all valuable expertise that helps projects to develop, recognises what’s most needed in the area and ensures the money is spent as wisely as possible. Lizzy Ralph, a LAG member, informed guests that, “Being part of the Heart of Wessex Local Action Group is a really good way of getting involved, hearing about projects which are applying for funding and having your say in how the funding is invested.